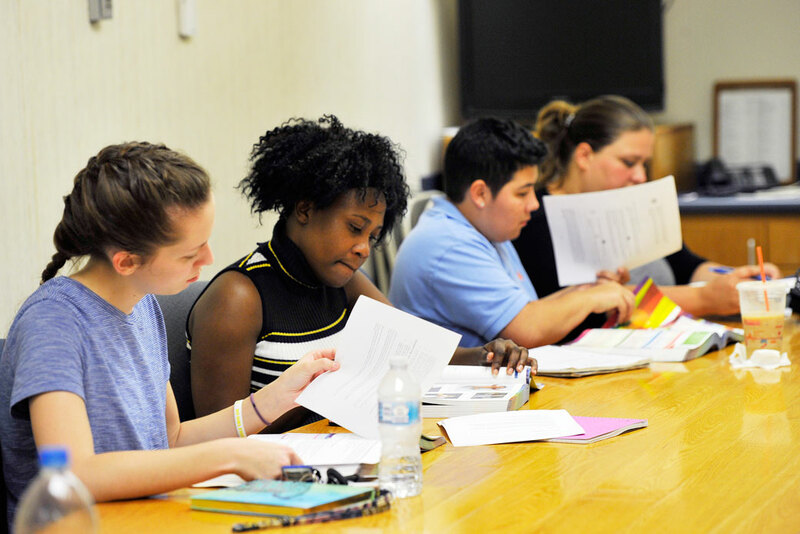 Students study during a training for certified nursing assistants in Portland, Oregon, July 2017. Creating and funding sectorwide labor-management training partnerships would benefit workers, business, and the larger economy. High-quality workforce training can help workers get good jobs, improve the efficiency of businesses, and boost productivity in the economy. Unfortunately, the United States supports too little workforce training, and the training it does support too often fails to lead to good jobs or boost productivity. Government policy is not currently up to the challenge, and neither businesses nor workers can solve these problems on their own. For this reason, a new kind of policy is necessary to ensure that training improves the productivity of the workforce and leads to high-quality jobs. Businesses are training far fewer workers than they did in years past, despite being the largest source of funding for workforce training.1 And when businesses do train their workers, they tend to invest in the ones who are more highly educated or highly paid.2 Moreover, the way businesses have increasingly chosen to structure work—away from the traditional employment relationship and increasingly toward contracted work—suggests that, in the future, they are likely to reduce their spending on and involvement in training even further. Workers have little room in their budgets to pay for more training. Today’s typical male worker earns roughly the same inflation-adjusted hourly wage as did his counterpart four decades ago, so taking on further debt is a risky proposition.3 Workers also have little ability to ensure that the training they receive will lead to a good job, as they have minimal input into most training programs and limited power to improve the quality of the jobs for which they train. Exacerbating this is the fact that a smaller share of workers are members of unions today than several decades ago. In the current economy, workers are increasingly on their own, without sufficient tools and the structures they need to succeed. Government spending on training falls woefully short, not only failing to compensate for the withdrawal of employer funding but actually declining in recent years.4 Moreover, government-funded training is of varying quality. Government policy does not always encourage the type of training that research has shown to be particularly effective: training that incorporates employers’ and workers’ needs and is sector-based—focusing on the employer-identified skills that are needed to succeed in specific in-demand industries, such as health care, manufacturing, construction, or information technology, rather than in individual companies. These challenges create a need for a new model of workforce training. In this model, the government would increase funding for training and, perhaps more importantly, help organize and structure the training so that it would be high quality and involve and address the needs of both businesses and workers. The federal government as well state and local governments could adopt this general approach. Increase share of labor representation on state and local workforce development boards. Offer training designed and delivered in partnership with employers and unions—or other worker organizations—so that the key participants are invested in the success of the program and have a voice to make sure that the program meets their needs. Establish a dedicated funding stream to support labor-management workforce intermediaries. Supply sufficient, dedicated funding from government to labor-management workforce intermediaries in order to meet current and future training needs. Expand opportunities for workers to join together in order to ensure that training leads to good jobs.Ensure that training is organized on a sectoral level so that it provides transferable skills that are needed by a range of employers in growing industries. Adopting this policy would help address fundamental challenges in the U.S. economy and benefit both businesses and workers by boosting productivity and creating clear pathways to good jobs. While there is evidence that training raises workers’ productivity and wages as well as improves employment outcomes, it is important to recognize the limitations of the benefits that training, by itself, can deliver to workers.5 As a stand-alone policy, training will not sufficiently raise wages or improve job quality—especially if it is delivered in its current form. To improve job quality, a range of reforms is necessary—including policies that raise workplace standards such as the minimum wage; ensure full employment; strengthen worker voice and power; and improve skills. This report focuses on how workforce training can be reformed so that it is as likely as possible to lead to a good job. The report first discusses the benefits of high-quality sectoral job training as well as the need for increased worker voice in training. It then describes the existing public workforce system and existing funding for training programs, highlighting elements upon which reform could build. Finally, it outlines an effective model of reform and proposes recommendations that are necessary for successful implementation. The proposed training reforms will ensure that far more workers receive high-quality training; they will also allow critical steps toward ensuring that the jobs workers are trained for are worth the effort. These reforms will give workers a greater say in how their training is designed and delivered as well as improve the quality of jobs to which the training leads. This will make workers key partners with businesses and their communities in improving workforce training. While the United States’ current training system too often fails to deliver, it contains many of the elements necessary for success. By building on the best parts of the current system, policymakers can build a far better training system that benefits workers, businesses, and the larger economy. The best training programs are those that have a strong connection to industry and to employment and that provide sufficient services to help workers complete the program.12 Quality programs also provide access to essential wraparound services, such as child care, transportation assistance, and other resources, that make it easier for workers, particularly low-income workers, to enter into and successfully complete a training program.13 Recent research has found that sectoral programs in particular—those that provide worker training in targeted, in-demand industry sectors—are effective in raising participants’ wages and improving employment opportunities. Sectoral training programs are defined by their relationship to a specific industry or industries. Programs are developed with local employers’ needs in mind, and with their input. These programs generally attempt to serve the needs of multiple employers in a local labor market rather than offer firm-specific training, thereby ensuring greater worker mobility. Over recent decades, the economy has shifted in ways that have made it particularly important for workers to have a role in designing and delivering workforce training. Training and career ladders are different from what workers experienced in the middle and later parts of the 20th century. Employers are providing less help and structure than they previously did, and workers are increasingly responsible for developing their own skills and managing their own careers. In addition, as firms increasingly focus on their core competencies, the workplace has “fissured.”23 Jobs that once were part of a central firm are increasingly contracted out, outsourced, franchised, or reclassified to independent contractor status. Firms take even less responsibility for the needs of workers who are deemed to fall outside of their core competency, and the companies doing the less profitable work, which has been farmed out, often do not have the margins or stability to invest in training. At the same time, unions have lost strength. In the United States, joining together in a union is the most effective way for workers to influence training. Additional kinds of worker organizations—such as works councils, which are common in Europe—could also potentially provide a way for workers to shape training, as long as the organizations are democratic, with the sole mission of representing workers. Other types of organizations such as community colleges may emphasize many of the same issues as worker organizations, but their missions are focused elsewhere. Polls show that workers would like a greater voice at work, but U.S. law increasingly allows significant employer interference with worker organizing and makes it unnecessarily difficult to form a union or even a nonunion worker organization, such as a works council.26 As a result, neither unions nor some other type of worker-led organization have been able to fulfill workers’ need and desire for greater input on workplace issues such as training. These changes mean that workers have less voice, less security, and greater difficulty getting training. Workers are increasingly on their own and in need of help. In this environment, it makes sense to create a way for workers to have a stronger voice in the design and implementation of training—via unions or other worker organizations. Doing so would help workers to get more training and ensure that the training they receive meets their needs. The existing public workforce system does not perform as well as it could. It trains too few workers, does not always deliver high-quality training, and does not consistently ensure that training leads to a good job. Still, the system does deliver for some workers and businesses and it contains a number of elements upon which to build. Indeed, the multistakeholder model in workforce boards and some of the existing funding mechanisms provide an adequate base that can be reformed and built upon. The next sections describe these building blocks in more detail before discussing how they could be reformed into a true partnership that delivers for both businesses and workers. Local board makeup largely mirrors state board makeup, but the former requires additional representation from other locally relevant stakeholders, such as education and training providers. The most recent WIOA authorization established several new policies to improve the functionality of the workforce system. Among them was a requirement that local boards “develop, convene, or implement industry or sector partnerships.”31 Industry or sector partnerships bring together employers; the local workforce system; education and training providers; and other stakeholders to develop in-demand training programs that meet local employer demand. In short, the public workforce system, in many respects, is already set up to emphasize a collaboration among businesses, workers, and the community. The problem is that the collaborations within state and local boards and within the organizations they fund are not always true partnerships because workers have far less voice in the system than do businesses or other organizations. Furthermore, despite the introduction of new policies supporting sector partnerships, the investments made in training at the local level are not consistently oriented toward a sectoral model. The number of workers who receive WIOA-financed training each year is quite small. The Department of Labor estimates that in fiscal year 2017, more than 23 million Americans accessed WIOA training and employment services such as job search, labor exchange, or other career services.32 The core WIOA adult, dislocated worker, and youth funding streams serve about 1.2 million of these workers annually. Among those workers, just 11 percent of adults and 14 percent of dislocated workers receive training through the workforce system. About 35 percent of youth receive some basic or occupational skills training.33 It is unknown how many of these workers participate in sectoral training programs. WIOA funding is disbursed by the federal government to the states. Eighty-five percent of the state funding then flows to local workforce development areas, while 15 percent is reserved for statewide activities.34 Funding for WIOA is administered primarily through six core programs: WIOA Adult, WIOA Dislocated Worker, WIOA Youth, Adult Education and Literacy, the Wagner-Peyser Employment Service, and Vocational Rehabilitation.35 Those funds can be used for a range of activities, including on-the-job training, career development, job search assistance, and customized training. Workers participating in WIOA’s adult and dislocated worker programs can also obtain training vouchers called individual training accounts (ITAs) to pursue training with a training provider that has been approved by the local board. The federal government generally invests slightly less than $3 billion annually across the WIOA adult, dislocated worker, and youth programs.36 However, WIOA is not the only funding source for training. Federal funding from the Higher Education Act of 1965,37 which authorizes federal student grants and loans, as well as the Carl D. Perkins Career and Technical Education Act,38 also serve as a funding source that supports the development of job training programs at community colleges.39 Indeed, a significant amount of workforce training occurs at community colleges and is funded by the higher education system, not the public workforce system. Even though Congress has not provided additional funding to support sectoral training, the Obama administration made funding available for sectoral training models throughout its time in office. In 2014, following a review of federal job training programs led by former Vice President Joe Biden, the White House released a report identifying effective workforce strategies that the administration would deploy or was deploying in its grant-making.41 The report identified the creation of regional partnerships promoting collaboration among the public workforce system, education, labor, employers, and nonprofit organizations as an essential strategy that could support people to overcome barriers to employment.42 The Obama administration utilized the same regional partnership model in subsequent grant-making initiatives. In short, federal and state governments provide significant but inadequate funding for workforce training, and there has been some limited movement to encourage sectoral training. Since 1992, New Jersey has operated a Workforce Development Partnership Fund, which was created to provide training grants to dislocated and disadvantaged workers as well as employer-provided training for incumbent workers.53 The fund is supported by small joint payroll contributions from workers and employers.54 While the program does not explicitly fund training that is delivered through a joint labor-management model, it does provide a useful framework for supporting labor-management workforce intermediaries. The joint labor-management partnership model could be modified and expanded to achieve two complementary goals: ensuring that more workers benefit from high-quality training and that training leads to a good job. The goal is to encourage high-quality sectoral training that is developed and delivered through a joint labor-management intermediary structure. Worker organizations and employers would help design and oversee the training. State and federal programs would include representatives of workers and businesses in order to ensure that state and federal funding goes to areas that most need training as well as to jobs where workers share in training’s benefits. These new government-supported labor-management partnerships would benefit employers and the larger economy by providing a pipeline of workers from a high-quality training program. Workers would benefit from increased access to high-quality training that is likely to lead to a good job. Worker organizations would benefit from having a more visible, formalized role in workforce training as well as greater access to workers, helping them to potentially recruit new members. Workers need to have more of a say in what training they receive, how much training they receive, and when and how training is delivered. However, the current federal system that supports training investments does not provide sufficient worker voice in these decisions. Worker organizations can help deliver training that is better targeted to worker needs and that offers an avenue to increased worker voice in the workplace. The Center for American Progress proposes to recalibrate the workforce system in order to give workers more influence in training investment decisions that happen at the local level. We propose doing so by increasing the share of worker voice on state and local workforce investment boards as well as by expanding public and private sector investments in high-quality sectoral training programs that are developed and delivered by partnerships between labor and management through a workforce intermediary. When WIOA’s predecessor, WIA, became law in 1998, it reduced the level of labor and community involvement that was allowed under the Job Training Partnership Act—WIA’s predecessor.67 By making this shift, WIA and WIOA may have deprioritized the needs of workers. For example, WIOA—like WIA before it—requires a majority-business board.68 WIOA does require at least 20 percent of board membership at the state and local levels to be comprised of workforce representatives, including two representatives of organized labor and one representative of a joint labor-management registered apprenticeship program. This represents an improvement over WIA, which merely required that boards include labor representatives, without specifying the extent of their participation on the board. However, WIOA still allows for an outsized employer voice, which, in turn, can mean that worker voice is diminished. To that end, CAP proposes that policymakers increase the share of worker representation on both state and local workforce development boards. Rather than 50 percent employer membership and 20 percent worker representation, we recommend moving to a new model whereby one-third of board members are employers, one-third represent workers, and one-third represent other stakeholders, including elected officials, education and training organizations, and community development organizations. While this shift in board representation would involve a statutory change, states and localities can take steps now to increase labor’s share of representation on local boards by simply adding more representatives of labor organizations to their ranks, like Washington state has done. 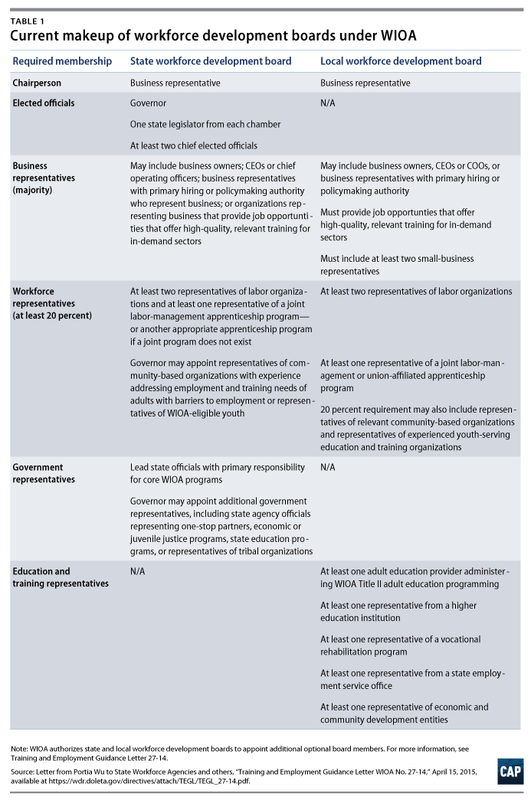 WIOA requires that local workforce development programs utilize sector partnerships, but, unfortunately, the law does not include additional funding to develop and support those partnerships. Policymakers should dramatically increase investments in joint labor-management workforce intermediaries to develop sectoral training programs. This change would ensure that workers have a say in how these programs are developed; in the recruitment, mentorship, and retention of workers; and in guaranteeing that the programs are structured to offer sufficiently general skills in order to promote worker mobility. It would also ensure stable, dedicated funding to effective worker training programs. The integration of workers and their organizations into training helps bind the system together, providing not only a way to accumulate and structure the needs and interests of a diverse workforce but also helping strengthen workers’ ability to advocate for continued funding for training and to push employers to provide quality jobs. Therefore, the integration of worker organizations into the training systems promotes good jobs by directly increasing the quantity and quality of training and indirectly increasing the capacity of workers to improve their jobs. There is a strong need for more and better workforce training. Unfortunately, the current U.S. system is not set up to deliver. Employers, unions, and the government are currently unable to meet the need on their own. The policies proposed in this report would improve and expand worker training by creating a durable partnership among employers, worker organizations, and government. The policy proposal builds on proven concepts that have a track record of success, and the implementation of these policies would benefit not only workers but employers and the larger economy as well. Angela Hanks is the director of Workforce Development Policy at the Center for American Progress. Her work focuses on developing and promoting effective workforce development policies that raise the skills, wages, and employment opportunities of workers. David Madland is a senior fellow and the senior adviser to the American Worker Project at American Progress. He has written extensively about the economy and American politics on a range of topics, including the middle class, economic inequality, retirement policy, labor unions, and workplace standards such as the minimum wage. Madland is the author of Hollowed Out: Why the Economy Doesn’t Work without a Strong Middle Class, which was published by the University of California Press in 2015. The authors wish to thank Cheryl Feldman, Daniel Bustillo, Daniel Marschall, Andy Van Kleunen, Kevin Reilly, Carmel Martin, and Mark Kessenich for their thoughtful feedback on this project.